We did it! 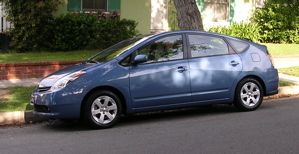 Thursday evening we drove out to Glendora and picked up our new Prius. So far, we’re very happy with it. The UI is a little funky, and I really need to sit down with the manual to figure out how to actually fully use the navigational system, but it’s fun to drive, and we feel really good about having a hybrid.